I’m packing for two weeks away from home, an extended visit to Western Australia for a batch of cookery classes on the far western shores of Australia. If you want to attend any of the classes, sorry, but all are totally booked out, except for one venue. As I always do before big events, I like to meditate on the essence of life to keep me stable and focused. Allow me to share with you an excerpt from one of my favourite chapters of one of my favourite books. Hare Krishna. 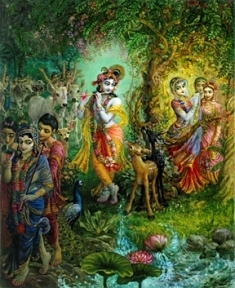 “The brahmanas’ wives saw Krsna with a blackish complexion, wearing a garment that glittered like gold. He wore a nice garland of forest flowers and a peacock feather on His head. He was also painted with the minerals found in Vrndavana, and He looked exactly like a dancing actor on a theatrical stage. They saw Him resting one hand on the shoulder of His friend, and in His other hand He was holding a lotus flower. His ears were decorated with lilies, He wore marks of tilaka, and He was smiling charmingly. From Chapter 23 of ‘Krishna, The Supreme Personality of Godhead’ by Srila A.C. Bhaktivedanta Swami Prabhupada.